What better way to get in on the popularity of slots like Raging Rhino then to come out with your own wild animal-themed, highly volatile, 4096 line game yourself. That is exactly what Playtech have done with Buffalo Blitz, which joins a cast of North American outback inspired titles from various developers. Most of which are not for the faint-hearted and Buffalo Blitz slot certainly falls into that category. Playing Buffalo Blitz in free play mode using the game we have on this page is highly recommended for many reasons. Many unsuspecting players will fire Buffalo Blitz slot up, chuck a big chunk of bank roll at it and see absolutely nothing for their endeavors. It is brutally volatile, just as WMS’ Raging Rhino, Novomatic’s Book of Ra Deluxe or BTG’s Bonanza slot are. Even more so than Aristocrat’s Buffalo slot, which looks gentle in comparison. Get a feel for this one first before you deposit and play for real money – I highly recommend it! Buffalo Blitz is Playtech’s equivalent to WMS’ raging Rhino but this time we have a theme consisting of North American wildlife with the buffalo naturally being the highest-paying symbol at 7.5x bet for a single way of 6. Other high-paying symbols are the Cougar, Moose, Racoon and Brown Bear There are 6 reels of 4 rows each you see and as there are no fixed pay lines you have a massive 4096 ways! You play at a 40-coin minimum stake and the symbols are all stacked with the exception of the Diamond Wild on reels 2-6 which doesn’t multiply – yet! The prime symbol of the buffalo and the rest of the animals plus the card values can all appear 4-high on all reels. I mentioned the Rhino above and you may not be surprised to know that ALL pays on Buffalo Blitz are exactly the same. I have noticed by looking through the reels spins that a full screen of buffalo seems to be possible and if that landed you’d hit a huge 30720x stake win but it’s equally possible that this outcome is not in the results pool because of a cap – who knows? Bonus spins with a bang! You get a simple yellow Free Games scatter on all reels with only 3 of them yielding 8 free spins, 4 awards 15 right up to all 6 which would land you 100 free spins. The Diamonds in this bonus get given a random multiplier of either 2, 3 or 5x in these free spins, with merely 2 scatters awarding 5 extra spins should they land. Now where have you seen that before? Your Wilds appear on the last 5 reels so theoretically you could have a multiplier with 5 of 5x Wilds of 3125x of any symbols on reel 1, so potential is colossal. This game has a very volatile bonus plus the base game can be harsh, as you may expect with the very high wins it can pay. You have a standard RTP of 95.97% here and as with it’s orange friend the Rhino the bonus spins can retrigger over and over with very few wins. Then again, if you’re playing at the Big Game Hunter here sometimes the big prize can land in your lap. 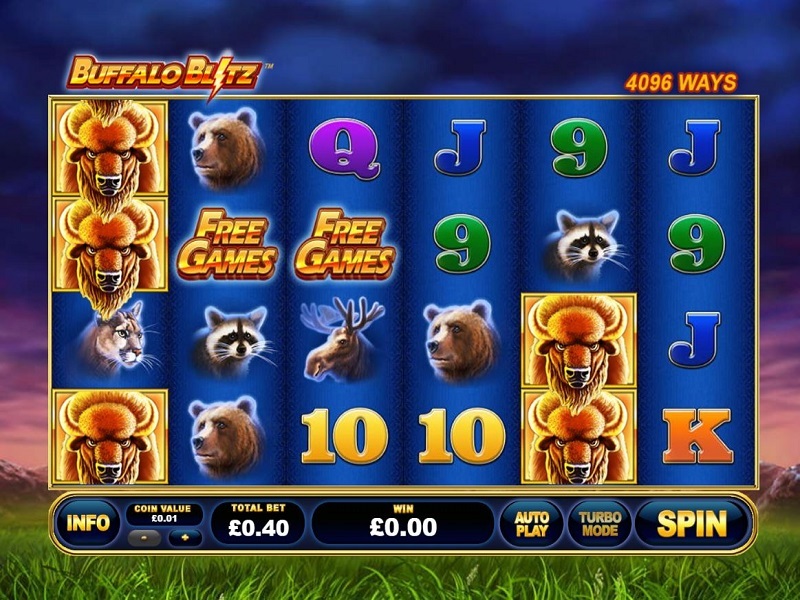 Buffalo Blitz is a really good attempt by Playtech to try and crack the ‘Wild Beast’ slot market. Wild in theme and wild in play action. Taking on this great stomping mammal can go only one of 2 ways; either really well or really bad. Be cautious with Buffalo Blitz slot and don’t bet beyond your means as it will quickly find you out and leave you with little bank roll left to play with. Just like the wild animal itself, this one needs to be treated with a lot of respect! Need to know more about Buffalo Blitz before depositing and playing for real? You are in the right place, simply click the play button on our video and you will learn all about this game – from the key symbols to how the bonus features are triggered and their potential rewards. Get up to speed with Buffalo Blitz with this video guide and you will be more the wiser before you set foot on that vast North American plain.